Gynostemma Pentaphyllum is known as “Southern Ginseng.” It is considered a powerful adaptogenic herb similar to Ginseng and does not have any side effects. 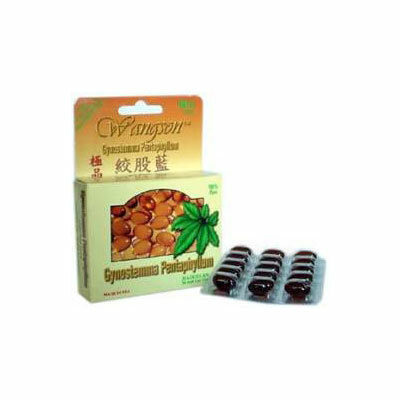 Wangson™ Gynostemma Pentaphyllum is made by using a patented process that purifies and concentrates the active principles called “Gypenosides” to a level of no less than 98%. Gynostemma Pentaphyllum is a powerful adaptogenic herb in China and Japan for thousands of years. From the cucumber family, this herb grows traditionally in a mountainous region in South Central China, an area known for the longevity of its inhabitants and reportedly low rates of cardiovascular disease and cancer. It has been used by Chinese folks for centuries as an expectorant and as a natural way for relieving inflammation. Moreover, it is used as an adaptogen since it has the unique ability to restore homeostasis to the body systems which includes blood pressure, reproductive function, digestive function, immune response, mental function, physical performance, and other physiological mark. Therefore, it is referred as a “miracle grass”. Because of its tonic similarity with ginseng, Jiaogulan is also known as “southern ginseng”. However, it has some miraculous effects that ginseng does not. The quantity of special saponins “Gypenosides” from Jiaogulan, which are very similar to gypenosides found in ginseng, is several folds higher. More than 72 individual saponins has been identified from pharmacological review and most of those have effect in maintaining a normal balance. Due to its higher quantities, Jiaogulan has attracted the attention of many medical and pharmacological scientists from not only China and Japan but also Europe, USA, and many other countries. • May maintain the cholesterol, triglyceride and other lipoprotein levels. • May improve cardiovascular function and lower blood pressure by decreasing vascular resistance and increasing coronary blood flows. • Stimulate tissues to revitalize physiological activities and act as an adaptogenic tonic which may assist in recovery from illness and fatigue. • May slow down the aging process. • Is a powerful antioxidant, protecting the body from free radical damage. • May strengthen the immune system to resist diseases. • Help protect people against radiation damage, reduce the impact of radiation treatment. • Assist to improve the quality of sleep. • Stimulate appetite and help prevent constipation through its adaptogenic properties. Take two to four capsules per day. Do not use this product if safety seal under cap is torn or missing.